\/Brittany\/ wrote: ^^LOL yeah! I love when Edward threatens to break Jacob's jaw in Eclipse if he ever returns Bella in less than perfect condition. OMG, Me TOO! lol, right now I'm on page 336 of Eclipse, almost there. One of my favorite scenes, EVER! lol I was giddy when Edward finally got...well, how do I say this? Possessive? lol. I was like FINALLY! "He kissed me," I growled. "And if you ever kiss her again, I will break your jaw for her," he promised, his voice still gentle and velvet and deadly. "She is mine." Edward's low voice was suddenly dark, not as composed as before. "I didn't say I would fight fair." Jacob nodded. "Yes, may the best man win"
I love all those parts too! I love when Edward shows his possessive side, not that I think that guys should go over board and be controlling, but I definitely like to see some possessiveness. I really, really enjoyed those parts! Me too! Thanx for posting those! TeamEdward1918 & \/Brittany\/, I totally agree about this scene. It is one of my favorites as well. Particularly in this scene, Edward is being hyperprotective without being overbearing or controlling. He could just as easily tell Bella, "see I told you he was dangerous, please don't ever go to LaPush again etc..." He doesn't. He reiterates to Jake his responsibility in keeping Bella safe, "you'll be running on three legs, dog." But, the key to this scene, what makes it so romantic is when he says he'll break Jake's jaw, "for her." It doesn't have a damn thing to do with him. Edward hates violence almost as much as Carlisle does, but when it comes to Bella and her safety, nothing is out of the question. oh man after reading this I really want to read the books again! It's been about four months since I have (I've been forcing myself not to!) and can't remember anything that wasn't posted here. there are some really good ones here & some ones I didn't think about as romantic. (thanks for the insight.) I love these books & they just make me all girly and gooey. I want an Edward! 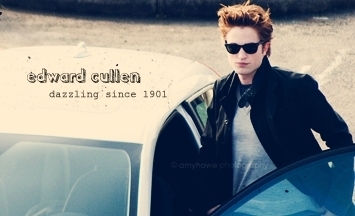 Jazz Girl wrote: TeamEdward1918 & \/Brittany\/, I totally agree about this scene. It is one of my favorites as well. Particularly in this scene, Edward is being hyperprotective without being overbearing or controlling. He could just as easily tell Bella, "see I told you he was dangerous, please don't ever go to LaPush again etc..." He doesn't. He reiterates to Jake his responsibility in keeping Bella safe, "you'll be running on three legs, dog." But, the key to this scene, what makes it so romantic is when he says he'll break Jake's jaw, "for her." It doesn't have a damn thing to do with him. Edward hates violence almost as much as Carlisle does, but when it comes to Bella and her safety, nothing is out of the question. He isn't overbearing just very protective and he isn't going to give her up without a fight. "She is mine." ahhhhhhhhhhhhh! ^^Me too! I want a protective guy! "Edward! You stayed!" I rejoiced, and thoughtlessly threw myself across the room and into his lap. In the instant that my thoughts caught up with my actions, I froze, shocked by my own uncontrolled enthusiasm. I stared up at him, afraid that I had crossed the wrong line. It shows that he really, truely accepted Bella into his life. This scene is cutesy and playful on the surface, but if you look into it, it means so much more.